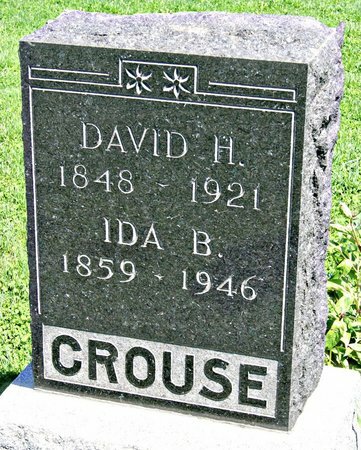 David H. Crouse, son of Empson Crouse and Mary Horsman, was born Mar. 19, 1848 in Clinton Co., Ohio and died May 25, 1921 in Clarinda, Page Co., Iowa. He married Ida Bell Hiatt Oct. 5, 1888 at Bedford, Taylor Co., Iowa. She was born Aug. 4, 1859 in Randolph Co., Indiana, daughter of Americus Hiatt and Harriet Andrew, and died Aug. 20, 1946. Searching for IDA BELL HIATT CROUSE in Taylor County Iowa?